Marabou storks (Leptoptilos crumenifer) feeding in shallow water, Lake Ndutu, Serengeti, Tanzania. The Marabou storks are more known as carrion feeders (hence the nickname 'undertaker birds'), which is facilitated by the lack of feathers on their heads and necks. However, if given the opportunity, e.g., during the rainy season, they will feed on fish and crustaceans. 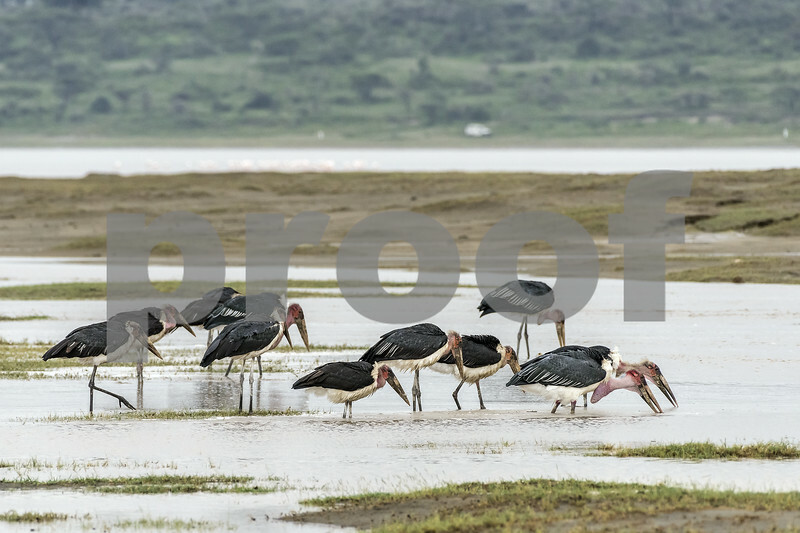 After a heavy rain, Lake Ndutu overflowed its banks and the Marabou storks flocked to the water to feed. Fabulous capture of this group of storks! These are most unique looking storks. Great capture. Great shot. They posed well for you. A great shot and info.